A modern alternative to sending (binary) digital information via electric voltage signals is to use optical (light) signals. Electrical signals from digital circuits (high/low voltages) may be converted into discrete optical signals (light or no light) with LEDs or solid-state lasers. Likewise, light signals can be translated back into electrical form through the use of photodiodes or phototransistors for introduction into the inputs of gate circuits. One way to avoid the problems of open-air optical data transmission is to send the light pulses down an ultra-pure glass fiber. Glass fibers will "conduct" a beam of light much as a copper wire will conduct electrons, with the advantage of completely avoiding all the associated problems of inductance, capacitance, and external interference plaguing electrical signals. Optical fibers keep the light beam contained within the fiber core by a phenomenon known as total internal reflectance. These layers of glass are very thin, the outer "cladding" typically 125 microns (1 micron = 1 millionth of a meter, or 10-6 meter) in diameter. This thinness gives the fiber considerable flexibility. To protect the fiber from physical damage, it is usually given a thin plastic coating, placed inside of a plastic tube, wrapped with kevlar fibers for tensile strength, and given an outer sheath of plastic similar to electrical wire insulation. Like electrical wires, optical fibers are often bundled together within the same sheath to form a single cable. Optical fibers exceed the data-handling performance of copper wire in almost every regard. They are totally immune to electromagnetic interference and have very high bandwidths. However, they are not without certain weaknesses. 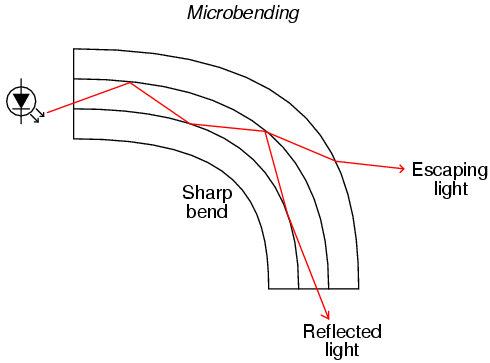 Not only does microbending lead to diminished signal strength due to the lost light, but it also constitutes a security weakness in that a light sensor intentionally placed on the outside of a sharp bend could intercept digital data transmitted over the fiber. However, if the fiber core is made small enough (around 5 microns in diameter), light modes are restricted to a single pathway with one length. Fiber so designed to permit only a single mode of light is known as single-mode fiber. Because single-mode fiber escapes the problem of pulse stretching experienced in long cables, it is the fiber of choice for long-distance (several miles or more) networks. The drawback, of course, is that with only one mode of light, single-mode fibers do not conduct as as much light as multimode fibers. Over long distances, this exacerbates the need for "repeater" units to boost light power.